Entering the New Rochelle toll plaza on Interstate 95 (New England section of the New York Thruway) northbound. New York Governor Andrew Cuomo announced in June 2018 that the entire 570-mile Thruway system will convert to all electronic toll collection. The plaza at New Rochelle is one of three to be converted by the end of 2018. Photo taken August 29, 2005. The East Coast’s Main Street, Interstate 95 serves the entire Northeast Megalopolis, while also serving southeastern cities of Jacksonville and Miami along Florida’s east coast. The highway is an important factor in commerce and tourism, linking scenic New England with the subtropical environs of southern Florida. It passes through more states than any other Interstate highway. Interstate 95 in Florida is part of High Priority Corridor 49: Atlantic Commerce Corridor. Through northern New Jersey, Interstate 95 is part of High Priority Corridor 63: Liberty Corridor. In Connecticut, Interstate 95 is part of High Priority Corridor 65: Interstate 95 Connecticut. A short portion of Interstate 95 near Bangor, Maine is part of High Priority Corridor 50: East-West Corridor from Watertown to Calais. Overall, Interstate 95 follows U.S. 1, but it deviates from U.S. 1 in Georgia, the Carolinas, and Southern Virginia. Through those states, it follows U.S. 17 and U.S. 301, with a brief section that parallels U.S. 15 in South Carolina. 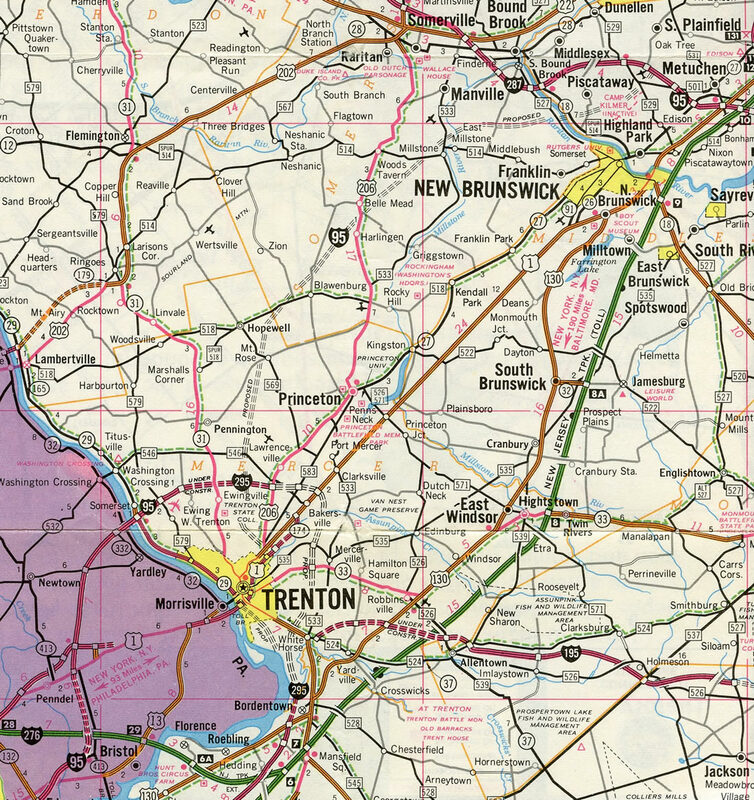 Although for the most part complete, Interstate 95 has a significant gap between the cities of Trenton and New Brunswick in New Jersey. This portion of I-95, known as the Somerset Freeway, was proposed but never constructed. Community opposition to the roadway, and opposition from the New Jersey Turnpike Authority, which feared lost revenue due to the competition of a free highway to the west, ultimately canceled the portion of I-95 between Lawrenceville and New Brunswick/Edison in 1982. 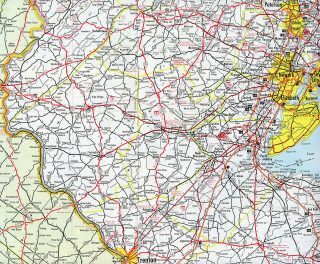 Ray Martin gives a descriptive account of the “Interstate 95 Gap” on his History of the Interstate 95 “Missing Link” of central New Jersey page. Part of the proposal for the Somerset Freeway in New Jersey included a short connector numbered as Interstate 695. It was never built either. Until the PA Turnpike / I-95 Interchange completion, I-95 remains routed northward to the Trenton Beltline, where it changes into Interstate 295 at the U.S. 1 interchange. Signage for Interstate 95 did not resume until near East Brunswick on the New Jersey Turnpike, but some reassurance shields were posted along the NJ Turnpike mainline in 2005 from Exit 6 northward. Trailblazers added in 2004 also route I-95 mainline traffic to the Turnpike via I-295 south and I-195 east. With the realignment of Interstate 95 onto the Turnpikes, the former portion of I-95 north from Bristol to the Trenton Belt Line freeway will become an extension of Interstate 295 west. This was confirmed by the FHWA on May 20, 2015 with the condition that I-95 between Bristol and Lawrenceville be referred to as Future I-295 and the Pennsylvania Turnpike east into New Jersey be referred to as Future I-95. 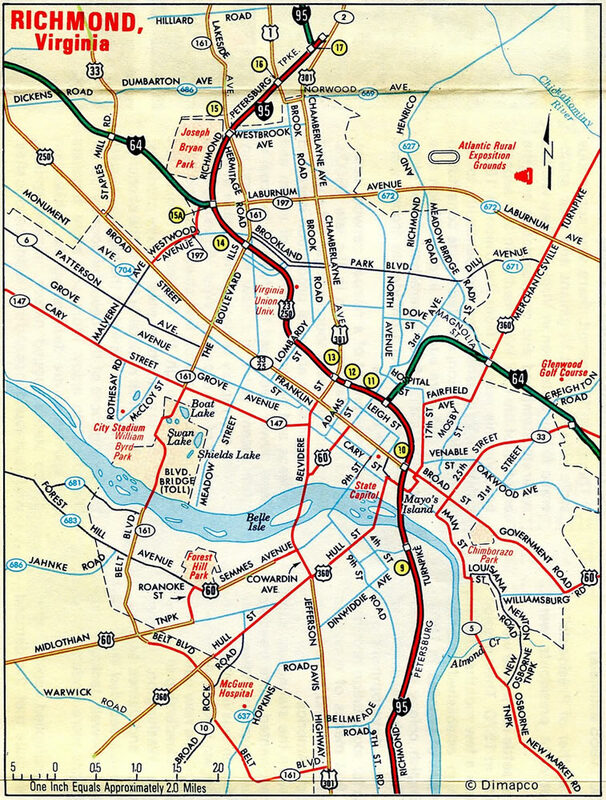 Previous discussion involving the relocation of I-95 between Bristol and Trenton in 2007 focused on extending Interstate 195 north over I-295 from Hamilton Township to Lawrenceville and west from U.S. 1 to Bristol, Pennsylvania over I-95. A separate plan arose in 2014 to renumber I-95 between Bristol and Lawrenceville as I-395, while retaining I-295 as it currently runs. Guide signs for the eventual turn of Interstate 95 south from the Pennsylvania Turnpike at Bristol already in place. Flyover construction for the future I-95 mainline continues through 2018. Photo taken 12/19/17. 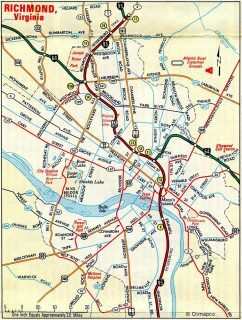 1959 – On the 1959 Shell (Gousha) Florida Map, Interstate 95 appeared as the “Jacksonville Expressway” from Beaver Street to the junction of U.S. 1 and U.S. 90 in South Jacksonville, the Fuller Warren Bridge (first segment to open). 1960 – Interstate 95 signed and built through downtown Jacksonville, up to Heckscher Drive. 1961 – Short section of Interstate 95 opened in Miami, including the link to Interstate 195. 1963 – Interstate 95 opened from the Golden Glades interchange to Hallandale and was signed on the already constructed Sunshine State Parkway from West Palm Beach north to Fort Pierce. Interstate 95 would remain signed on this section of the Sunshine State Parkway (later Florida’s Turnpike) until 1977. 1964 – Interstate 95 opened through the Golden Glades Interchange (Florida 826/Palmetto Expressway, U.S. 441, and Sunshine State Parkway) and then north to Florida 84 in Fort Lauderdale. 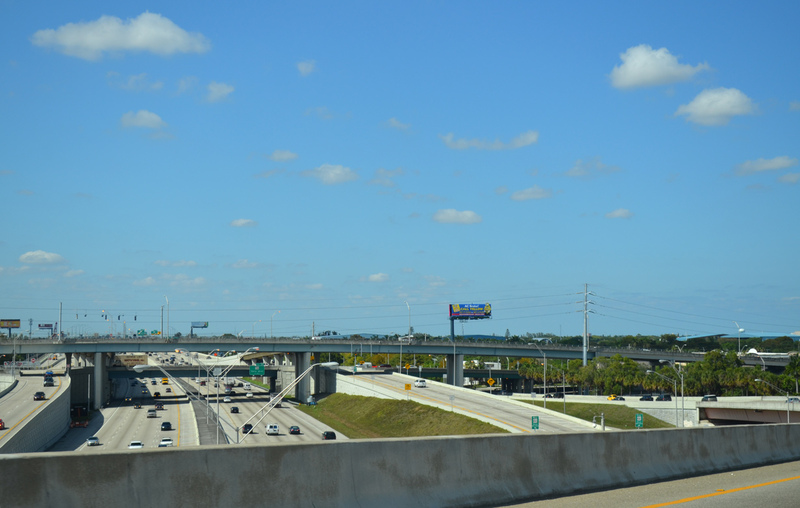 In Jacksonville, Interstate 95 was complete and opened between the South Jacksonville interchange and Florida 104. Interstate 95 under construction (1) at connection to Dixie Highway along South Bay Drive, (2) from Malabar to Mims, and (3) from Daytona Beach north to Jacksonville. 1965 – Interstate 95 opened (1) from Malabar to Eau Gallie and (2) from Daytona Beach to Bunnell. 1967 – Interstate 95 opened (1) from Eau Gallie to Scottsmoor and (2) from Bunnell to Jacksonville were opened. Interstate 95 under construction from Jacksonville north to Gross. 1968 – Interstate 95 (North-South Expressway) opened (1) from U.S. 1 north to Lummus Park and (2) from 20th Street to Interstate 195. Interstate 95 under construction: (1) at interchange with Florida 836 (Dolphin East-West Expressway), (2) from Florida 84 north to Florida 82, (3) from West Palm Beach to Florida’s Turnpike, (4) from Florida 60 north to Malabar, and (5) from Scottsmoor north to Daytona Beach. 1970 – Interstate 95 opened from Florida 60 to Gross. Interstate 95 under construction from Gross north to the Florida-Georgia State Line. 1971 – Interstate 95 opened from Gross to the Florida-Georgia State Line. 1972 – Interstate 95 was under construction from Fort Lauderdale north to West Palm Beach. Fort Pierce finalized. Interstate 95 shields removed from Florida’s Turnpike. Construction begins on section from Fort Pierce to Florida 60. 1978 – Interstate 95 opened from Indrio to Florida 60. 1979 – Interstate 95 opened Fort Pierce to Indrio. 1981 – Interstate 95 construction started from County Route 714 to Fort Pierce. 1984 – Interstate 95 opened from Port St. Lucie north to Fort Pierce. Gap existed between Port St, Lucie south to Palm Beach Gardens. The proposed connection between these two cities was still being determined, but the proposal shifted in 1984 to look more like the current alignment of Interstate 95. The Miami Metro Rail (an elevated commuter rail service) begins service in May 1984. 1985 – Interstate 95 opened from County Route 714 north to Port St. Lucie. 1987 – Interstate 95 opened from Palm Beach Gardens north to County Route 714. 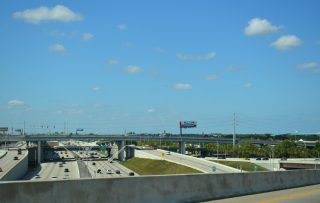 Interstate 95 is now complete from U.S. 1 in Miami north to the Georgia-Florida State Line, which is its original, planned route. As if the Interstate 95 gap in New Jersey was not enough of obstacle in the path, many alignments in the older Northeastern cities came about after much deliberation politically and socially among community leaders and officials of each respective city. The through route for Interstate 95 through the downtowns of Washington, D.C., and Boston was not constructed; the Interstate instead follows the bypass route. In Washington, D.C., Interstate 95 was originally planned to traverse the nation’s capital district, with a path northeast through the city, to the current Interstate 95/495 junction. Interstate 395 represents the portion of Interstate 95 that was built within the Capital Beltway. The most controversial section of the freeway included the “inner belt,” which included portions of unconstructed Interstate 95, Interstate 266, and Interstate 295. This inner belt would have passed through lower income areas, causing a great deal of protestation for such a road to impact that group disproportionately.16 The right of way for Interstate 95 north of downtown, from the District of Columbia boundary north to the Capital Beltway is still reserved, but it is used for power lines rather than a freeway. In Boston, Interstate 95 was intended to pass directly through the city, entering Boston from the southwest, then linking to a proposed but unconstructed Inner Belt Expressway (Interstate 695). From there, Interstate 95 would have followed the existing U.S. 1/Northeast Expressway, then travel north to the present Interstate 95/Massachusetts 128 West of Peabody. 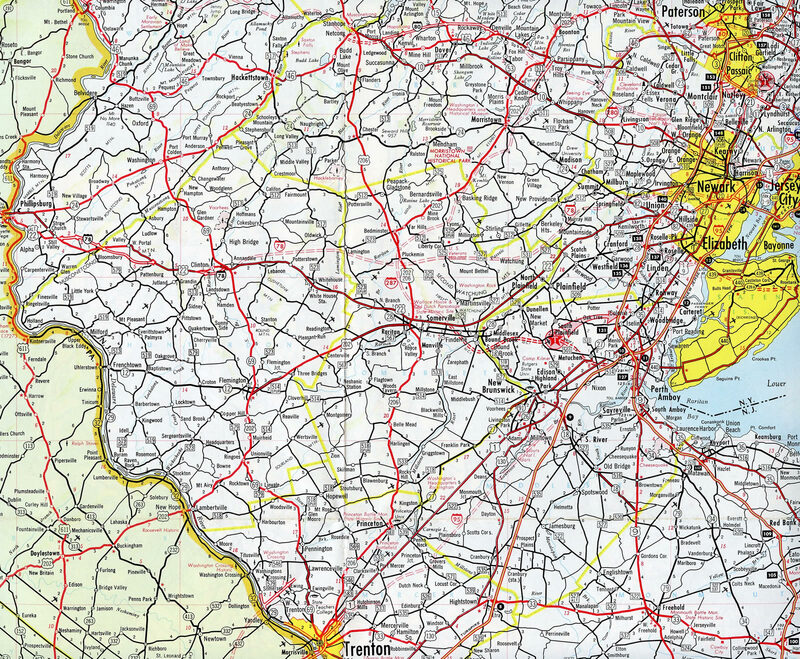 Neither the southwestern nor northeastern sections were completed, and they were withdrawn from the Interstate Highway System on May 23, 1974.25 Sections that were built are today part of Interstate 93 through Downtown Boston and U.S. 1 northeast of Downtown. In other cities through which Interstate 95 passes, the freeway was not always built with proper mitigation plans for the residents who were to be displaced. As a result, some residents whose houses were demolished to allow for the freeway to bring “progress” to their city were dismayed with the planning process. 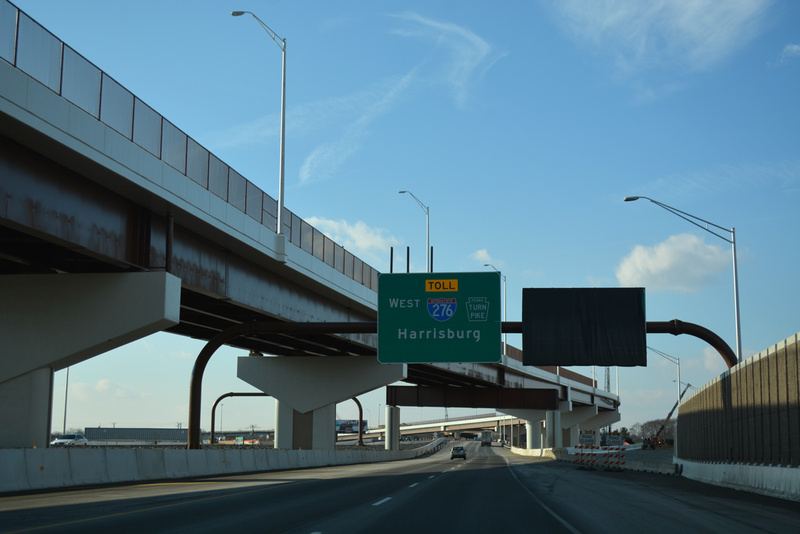 In places that were bisected by Interstate 95, such as Wilmington, Delaware, the new freeway was not welcomed by everyone. Many homes were demolished in the chosen path of the highway, which was just to the west of Downtown. The area neighborhood remains separated by the trenched freeway. 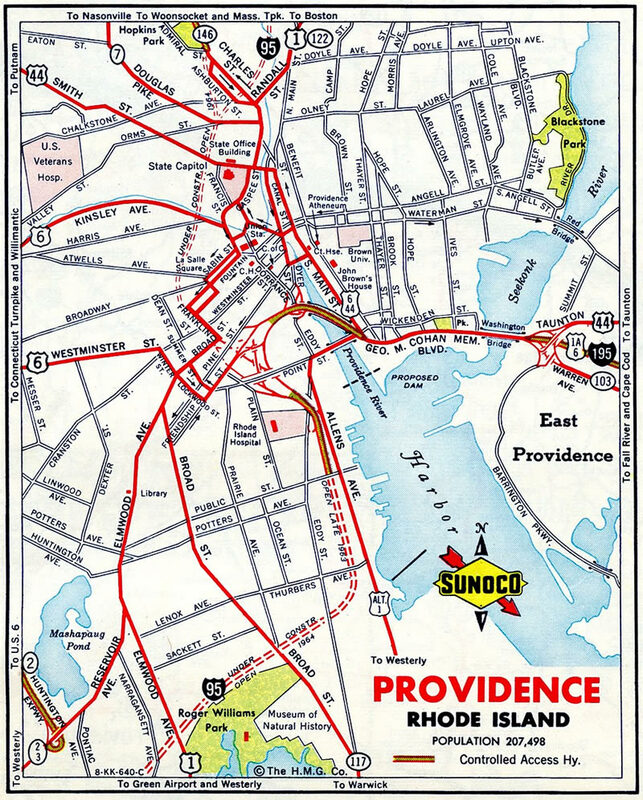 Construction of Interstate 95 through Providence, Rhode Island in 1958 required the acquisition of hundreds and homes and businesses and two historic churches. The path through Philadelphia required special considerations in 1961 because of the historical nature of Penn’s Landing and the redevelopment at the time of Society Hill and Washington Square East. In Jacksonville, Interstate 95 traveled through minority neighborhoods from the downtown to the Trout River. In Miami, Interstate 95 cut through the Liberty City neighborhood, which was (and is), the poorest part of Miami. Unfortunately Interstate 95 often took the path of “least resistance”, meaning where the land values were low, even if it meant the displacement of poor communities. * New Jersey mileage is measured from the Pennsylvania-New Jersey State Line near the future terminus at Florence, New Jersey via the New Jersey Turnpike to New York. ** Pennsylvania mileage is measured to the Pennsylvania-New Jersey State Line at Trenton. Opening of the interchange with Interstate 276 north of Philadelphia will make the ending terminus near Florence, New Jersey. The remaining section of Interstate 95 north of this interchange was redesignated as an extension of I-295. # Maine mileage was not updated on the December 31, 2017, route log to incorporate mileage changes as a result of the realignment of Interstate 495 in Maine on January 5, 2004. The actual mileage is 303.10 (source: MaineDOT Map Viewer). Interstates 95 and 595 come together at a stack interchange on the south side of Fort Lauderdale. This view looks north at I-95 from one of the flyover ramps. Photo taken 04/01/14. Interstate 595 is one of three spurs of I-95 in South Florida. Interstate 95 overlaid the original Richmond-Petersburg Turnpike from the north end of Interstate 85 to U.S. 301 & Virginia 2 (Chamberlayne Avenue). Tolls were dropped on the Turnpike in 1992. 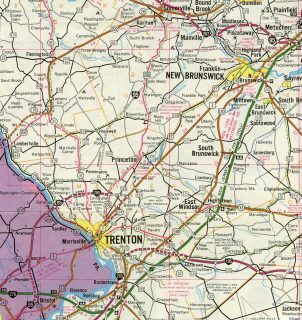 Early proposals for the Somerset Freeway took Interstate 95 east of U.S. 1 from Trenton directly to the New Jersey Turnpike near New Brunswick. The I-95 corridor through New Jersey shifted westward to parallel U.S. 206 to Interstate 287. This alignment included the proposed I-695 near Manville. 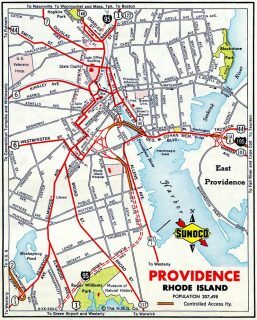 A short stretch of Interstate 95 was open south of Downtown Providence, Rhode Island in 1963. This connected with the then Providence River bridge of Interstate 195. The I-195 crossing was demolished after 2008 as part of the Iway project to relocate the freeway. Interstate 95 northbound along the New Jersey Turnpike in East Windsor Township. The Turnpike consists of a dual freeway with Inner and Outer Roadways. The Inner Roadway is restricted to passenger cars only. Photo taken 10/05/14. A $2.3-billion project between 2009 and 2014 rebuilt the New Jersey Turnpike from Exit 6 (Pennsylvania Turnpike Extension) to Exit 8A (NJ 32). Construction extended the Inner/Outer Roadway configuration southward from South Brunswick Township to just below Exit 6. I-95 shift onto the Turnpike mainline from Bristol, Pennsylvania via Exit 6 in September 2018. A significant portion of Interstate 95 has been or remains a toll road, generally because efforts to construct the toll road predates the creation of the Interstate Highway System. Here is an overview of those segments of Interstate 95 that have been or are toll roads. In Virginia, Interstate 95 (and the northernmost portion of Interstate 85) comprise the Richmond-Petersburg Turnpike. This 36-mile facility came into operation in 1958. The original plan for Interstate 95 was to route the highway around both Petersburg and Richmond along what is today Interstate 295. The Turnpike was originally planned as a temporary route for Interstate 95, but it would be transferred onto the new freeway once it was constructed. At that time, the Turnpike would become a state route, no longer in the Interstate Highway System. However, as the new freeway was constructed in stages between 1984 and 1992, it was signed as Interstate 295, not Interstate 95. In 1975, the turnpike bonds were paid off, but a subsequent expansion project to widen 22 miles of the Richmond-Petersburg Turnpike to six lanes and reconstruct certain interchanges resulted in another bond issuance. Those bonds were paid off by 1985, and other local projects funded by these tolls were completed by 1991. Tolls were eliminated on the Turnpike on July 1, 1992. Coincidentally, that was the same day that Interstate 295 to the east was opened to traffic.14 There are no plans to restore the tolls to the Turnpike. 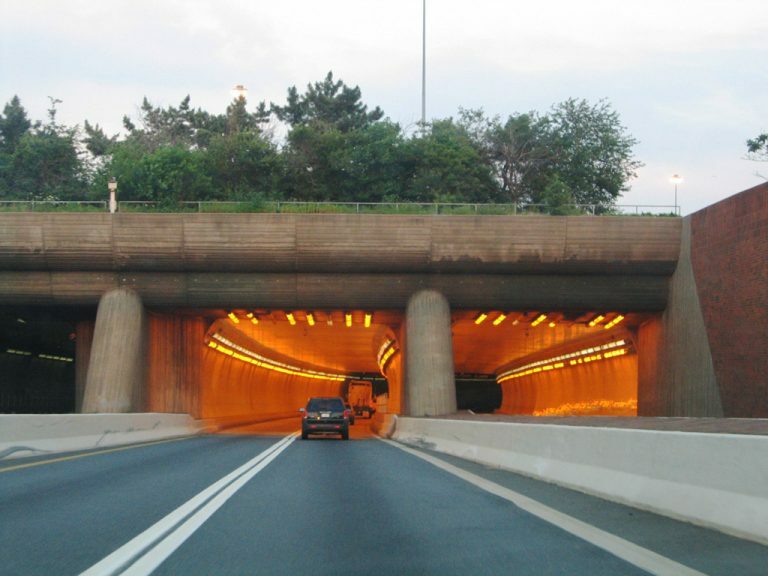 Northbound Interstate 95 enters Fort McHenry Tunnel. Photo taken June 22, 2005. The Delaware Turnpike, which connects the John F. Kennedy Memorial Highway with the Delaware Memorial Bridge (Interstate 295), was also constructed during the early 1960s. Built in tandem with the John F. Kennedy Memorial Highway, construction began in January 1962, and the freeway was opened to traffic in November 1963. There were plans to connect the Delaware Turnpike with the Chesapeake Bay Bridge (U.S. 50-301) in Maryland via the U.S. 301 corridor, but this route remains a conventional two to four-lane highway and is not a freeway. Exit 2, which is missing on the Delaware Turnpike, was reserved for the future connection with the unconstructed U.S. 301 freeway. At the northeastern end of the Turnpike is the Delaware Memorial Bridge, which today connects Interstate 95 to the southern end of the New Jersey Turnpike via Interstate 295. Interstate 95, however, continues north via the Delaware Expressway into Pennsylvania, where it enters the Philadelphia metropolitan area. In New Jersey, Interstate 95 uses the New Jersey Turnpike, entering the state via the Pennsylvania Turnpike Extension and traveling north on the New Jersey Turnpike from that point (Exit 6A) north to Interstate 80 and the approach to the George Washington Bridge. The section of mainline turnpike south of Exit 6A is designated as New Jersey 700 and is not part of the Interstate Highway System. Interstate 95W (unsigned), which is the 12-mile “western spur” of the New Jersey Turnpike in the vicinity of Newark, was opened in September 1970. It provides the best through route to the George Washington Bridge and through Interstate 95 traffic bound for New England. In addition, the New Jersey Turnpike bought the section of Interstate 95 from Interstate 80 in Ridgefield Park to the George Washington Bridge from the New Jersey Department of Transportation in July 1992, so that stretch is also part of the turnpike system. The George Washington Bridge, which carries Interstate 95 over the Hudson River, was built between October 1927 and October 1931; the bridge opened to traffic on October 25, 1931. A major increase to capacity was achieved when the lower level to the bridge was opened on August 29, 1962. As a result of this improvement, the bridge carries 14 lanes of traffic. Managed by the Port Authority of New York and New Jersey, the bridge has a sidewalk for pedestrians and bicyclists. For more information about the bridge, visit George Washington Bridge official site. Through New York City, Interstate 95 follows the Trans-Manhattan Expressway and Cross-Bronx Expressway from the George Washington Bridge east to the Bruckner Interchange with I-278, I-678 and Hutchinsin River Parkway, then follows the Bruckner Expressway northeast until the Bronx-Pelham Parkway interchange. From the Bronx-Pelham Parkway interchange (Exit 8B-C) northeast to the Connecticut State Line via Westchester County, Interstate 95 follows the New England Thruway. This extant section of the New York Thruway was constructed in the early 1950s and opened to traffic in 1958. So, between the mid-1950s and 2004, Interstate 95 followed the Maine Turnpike northward to metropolitan Portland, then departed the turnpike via the tolled Falmouth Spur. From the east-west Falmouth Spur, I-95 traveled to the northern end of Interstate 295 and onto a free highway alignment between Falmouth and Gardiner. A proposal to change the designation of Interstate 95, Interstate 295, and Interstate 495 was approved by AASHTO on October 11, 2002. Speed limits along the Maine Turnpike were increased on August 11, 2014. The section between mileposts 2.1 and 44.1 was increased from 65 to 70 miles per hour. The portion west of Portland and the Falmouth Spur increased from 55 to 60 miles per hour with the remainder of the Maine Turnpike north to milepost 109 upped to 70 miles per hour from 65. I – Completed in August of 1996 was the addition of a fourth southbound lane to Interstate 95 between Springfield and Newington. Construction of an Exit 169 ramp of Interstate 95 north to Spring Mall Drive, coincides with the completion Franconia-Springfield Metro Center. The facility opened June 1998. II & III – Between March 1999 and November 2001, construction resulted in the rebuilding of the Interstate 95/SSR 644 interchange. A high-rise overpass for Franconia Road between Interstate 95 to east of Frontier Drive was also built. IV – Road work that began November of 2000 constructed a direct bridge between the Capital Beltway west to Interstate 95 south and relocated the travel lanes of Interstate 495 eastbound through the same interchange. These aspects of the overall project were completed in late 2004. V – Work entails improvements to the Hemming Avenue junction with Interstate 495 and the ramp from Interstate 395 south to Interstate 495 west. Work began September 2001 and was completed by late 2003. VI & VII – Completion of the Interstate 95 northbound roadway alterations, including remaining local and through traffic ramps and HOV lanes. The Commonwealth Transportation Board awarded a $100 million contract for this phase on September 17, 2003.6 The project was completed in July 2007. VIII – HOV connections between Interstate 95 and 495. While the right-of-way was already acquired, VDOT removed this from the Springfield Interchange project and included it with the Capital Beltway Project. The work was completed on November 17, 2012 as part of the I-495 Express Lanes project. A short distance to the east of the Springfield Interchange is the Woodrow Wilson Bridge spanning the Potomac River. The original Woodrow Wilson Bridge opened to traffic on December 28, 1961 with just four lanes and a capacity of 75,000 vpd. After just eight years, the crossing reached capacity. The growth of the area and increase in through-traffic resulted in chronic congestion and traffic counts up to 200,000 vpd.3 Based upon this increasing demand, improvements were considered from the 1980s onward, with prior expansion of the bridge to six overall lanes. The first span (serving the outer loop) opened to traffic on June 10, 2006; the second span (serving the inner loop) opened on May 15, 2008. Remaining construction of the bridge and approaches continued through 2009, with the Telegraph Road interchange redesign completed by early 2013. Also a part of the Woodrow Wilson Bridge project was the improvement to Interstate 95 west and east of the Potomac and its surrounding interchanges. 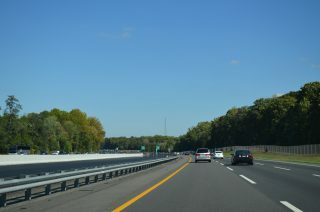 The junction between Interstate 295 and the Maryland 210 connector was upgraded into a high-speed interchange. New overpasses for Interstate 295/Maryland 210 were constructed and the “s-curve” ramps between the two routes were replaced with longer bridges to compensate for the wider beltway mainline. These projects began December 2001 and were complete by early 2004. $52 million in funding was involved. Additional work at Interstate 295 and Maryland 210 was the creation of access ramps from the Outer Loop to/from the National Harbor development. This coincided with the widening of the Outer Loop roadway to accommodate the new bridge and interim alignment shifts related to construction. Costing $45 million, the project involved the creation of 11 new bridges and six retaining walls. Road work ran from December 2002 to mid 2006. South from Springfield, another project completed along Interstate 95 was the installation of HOT lanes. As part of Virginia’s Public-Private Transportation Act, the $1 billion project affected 29.4 miles of Interstate 95, from Garrisonville Road north to Duke Street in Alexandria. This included changes the existing reversible HOV-3 roadway from south of Exit 152 (VA-234) to the Springfield Interchange (I-395/495), where tolls were implemented during the process. Groundbreaking took place on August 7, 201228. Broken into four segments, the portion between Prince William Parkway (VA-294) and Edsall Road (SSR 648) (Segments 3 and 4) expanded from two to three lanes. Segment 2 extended the existing HOV roadway southward 0.5 miles beyond Dumfries Road. Segment 1 built two new reversible lanes for 8.3 miles to Garrisonville Road in Stafford County. The lanes opened to traffic on December 14, 2014 with a free trial period until tolling commencedon December 29, 2014. Find more details on the 495 | 95 Express Lanes web site. Construction of the I-95 Express Toll Lanes from Baltimore east to Maryland 43 (White Marsh Boulevard) adds managed lanes to Interstate 95 from I-895 to just north of Exit 67. Work from 2006 to spring 2015 upgraded the exchange with Interstate 695 into a high speed symmetrical stack interchange, eliminated the left-hand ramp for I-895 south at the wye with I-95 south, and redesigned the exit with White Marsh Boulevard to accommodate HOT lane ramps. Two new lanes were added for each direction of Interstate 95 between the general purpose lanes along this stretch. The I-95 Express Toll Lanes opened to traffic on December 6, 2014, with the first week as a toll free facility. The $2 billion New Haven Harbor Crossing Corridor Improvement Program rebuilt and redesigned a 7.2 mile section of Interstate 95 between Exits 46 in New Haven and 54 in Branford. Constructed as part of the Connecticut Turnpike and opened to traffic in 1958, the overwhelmed stretch of freeway was expanded and modernized, with work starting in 2009. Included in the project was the replacement of the Q Bridge, a shoulder less six-lane span across the Quinnipiac River. It was replaced by a signature, extradosed bridge accommodating ten overall lanes of traffic. Named the Pearl Harbor Memorial Bridge, the new span opened partially on July 29, 2013, with two-way traffic on the eventual northbound span. A lighting system was implemented along the Pearl Harbor Memorial Bridge, with the first official illumination taking place on Independence Day weekend in 2016. Associated work replaces overpasses for Interstate 95 and cross roads north from Massachusetts 113 to the Interstate 95 Connector at Exit 60.33 All traffic on I-95 shifted onto the future northbound Whittier Bridge on December 4, 2015. This allowed crewed to demolish the old spans and begin work on the eventual southbound tied arch bridge. Construction on the project continues through early fall 2017. Interstate 95 through North Carolina was constructed between 1956 (as bypasses for U.S. 301) and 1980.11 The freeway remains with just four lanes statewide and traffic congestion is a growing concern. An idea first discussed in 2001, tolling Interstate 95 in North Carolina to help pay for its improvement again arose in fall 2003. In October 2003, state officials sought federal permission to implement a toll system on Interstate 95 to help cover a $3 billion price tag to overhaul the route. A consultant indicated to state officials that installing toll barriers at 30-mile intervals along the 182 stretch of highway at $3 a car would cover an expansion of Interstate 95 from four to eight lanes statewide. This would result in $2.4 billion in funds generated in a 30 year time frame. Governor Mike Easley in 2003 indicated that he did not support the idea of tolling Interstate 9512, and the tolling concept has not gained momentum. This is the final Interstate 95 northbound reassurance shield, found along the three mile stretch between U.S. 1 and U.S. 2 in Houlton. Photo taken by Patrick Lilja (07/26/05). Nearing the final interchange of Interstate 95 northbound between Houlton and the International Border in Aroostook County, Maine. Interstate 95 transitions into New Brunswick 95 after the Canadian Customs Station. New Brunswick 95 provides a freeway connection to Trans Canada Highway 2 and its freeway bypass of Woodstock. Photo taken 06/27/05. Motorists not destined for Canada must depart Interstate 95 via Exit 305. Exit 305 constitutes a trumpet interchange with U.S. 2’s eastern terminus north of Airport Road and Houlton International Airport (HUL). There is no U-turn ramp in place beyond the interchange like there is at California crossings into Mexico. Photo taken 06/27/05. Exit 305 departs Interstate 95 northbound for U.S. 2 to Airport Road. U.S. 2 turns west onto Military Street from Airport Road adjacent to the freeway. Airport Road leads south to Houlton International Airport and its Industrial Park. Military Street heads west 2.5 miles into downtown Houlton. Photo taken 06/27/05. End Interstate 95 shield marker posted just east of the U.S. 2 on-ramp at the Canadian border. 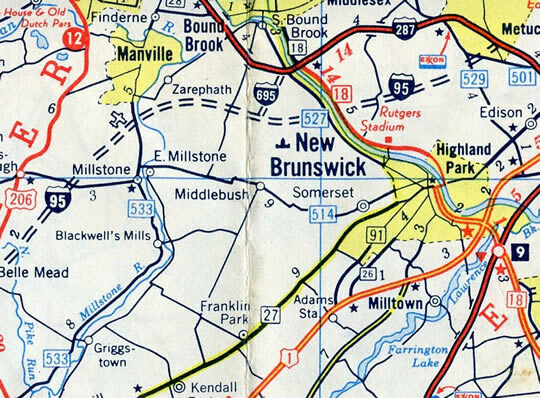 New Brunswick 95 continues the freeway east nine miles to Woodstock and Trans Canada Highway 2. Photo taken by Jeff Royston (12/02). As Northbound Interstate 95 transitions into New Brunswick 95, the freeway crosses into Atlantic Time Zone. Photo taken by Jeff Royston (12/02). A begin Interstate 95 shield assembly stands at the international border, prior to the port of entry for passage into the United States. Photo taken Ian Ligget (04/11/15). A closer look at the shield marker posted at the New Brunswick 95 west transition to Interstate 95 south. Photo taken by Jeff Royston (12/02). Welcome to Maine sign posted within the trumpet interchange (Exit 305) at U.S. 2. Photo taken by Jeff Royston (12/02). The first of many Interstate 95 reassurance shields posted southbound from Houlton to Miami. The initial stretch of I-95 leading west from U.S. 2 is the least traveled along the 1,920-mile route. Photos taken 06/27/05. Mileage sign along Southbound Interstate 95, two miles to Houlton and 120 miles to Bangor, the next major city along the route. Photo taken by Jeff Royston (12/02). U.S. 2 leaves Houlton en route to Houlton International Airport (HUL) and its eastern terminus at the final Interstate 95 interchange. Border Lane spurs east from U.S. 2 to dead end at the International Border with Canada. This was the original alignment of U.S. 2 prior to the construction of Interstate 95. Photo taken by Ian Ligget (04/11/15). Westbound Trans Canada Highway 2 approaching New Brunswick 95, which leads west into the United States to connect to the northern terminus of Interstate 95 in Maine. Photo taken by Jeff Royston (12/02). TCH Route 2 west reaches the trumpet interchange with New Brunswick 95 west to Houlton, Maine. NB 95 was upgraded to a full freeway in 2007, with an interchange added at NB 540 and Richmond Corner. Photo taken by Jeff Royston (12/02). The final reassurance marker appears as Interstate 95 & U.S. 1 swing southwest at SW 19th Road to parallel SW 1st Avenue and a Metrorail line ahead of Exit 1A to Rickenbacker Causeway. Rickenbacker Causeway spurs east as a toll bridge to Key Biscayne. Photo taken 04/01/14. U.S. 1 was relocated from Brickell Avenue onto an overlap with Interstate 95 south from the Downtown Distributor (SR 970) to the freeway end in winter 2014. A new sign was installed here in 2016 displaying Interstate 95 Ends instead of U.S. 1 Junction. The freeway continues with two lanes continue beyond Exit 1A directly to a wye interchange with Dixie Highway (U.S. 1) south to Coral Gables. Photo taken 03/04/14. Traffic slows to 45 miles per hour as U.S. 1 merges onto Dixie Highway from the south end of Interstate 95. U.S. 1 angles southwest to Coral Gables, South Miami, Pinecrest, and ultimately Key West. Photo taken 03/04/14. This end sign for I-95 was posted at the merge with Brickell Avenue (former U.S. 1) prior to 2016. U.S. 1 extends another 157 miles southward to its terminus at Key West. Photo taken 03/04/14. Prior to 2001, this sign posted a half mile out from the I-95 end also showed a white on red U.S. 1 shield, a remnant of Florida’s abandoned colored U.S. Highway shield scheme. The empty holes within the old sign were leftover from where yellow flashers had been. Photos taken by Gene Janczynskyi (08/00). Another red U.S. 1 shield remained in service at the Interstate 95 wye interchange with U.S. 1 (Brickell Avenue) south until 2001. Photo taken by Gene Janczynskyi (08/00). An older sign, partially obscured by the traffic signal mast arm, references Interstate 95 as the Downtown Bypass for U.S. 1. U.S. 1 traveled Brickell Avenue along the west shore of Biscayne Bay toward Downtown until January 2014, when maintenance of Brickell was transferred from FDOT to the city of Miami. U.S. 1 now overlaps with I-95 north to the Downtown Distributor (Exit 2A) east to bypass the previous alignment. Photo taken 03/04/14. Interstate 95 & U.S. 1 separate from Brickell Avenue (old U.S. 1) at a wye interchange. The freeway commences with two lanes initially to the on-ramp from Rickenbacker Causeway. Sign changes made here removed U.S. 1 from the right-hand panel but did not add it to the I-95 overhead. Photo taken 03/04/14. Older guide signs for the former split of Interstate 95 and U.S. 1 at Brickell Avenue were carbon copied after 2006. Photo taken 03/26/06. Still within the wye interchange at Brickell Avenue, the first northbound shield assembly for Interstate 95 appears. Photo taken 03/04/14. The Downtown Miami skyline comes into view on Interstate 95 & U.S. 1 north, one mile ahead of Exit 1B for U.S. 41. U.S. 41 ends at Downtown just east of the freeway. Photo taken 03/04/14. I-95 Widening. http://www.dot.state.sc.us/Projects/I-95/default.html South Carolina Department of Transportation (SCDOT) web site. “Springfield Interchange Improvement Project – Fact Sheet.” VDOT. The Woodrow Wilson Bridge Project. http://www.wilsonbridge.com/ Virginia Department of Transportation (VDOT) web site. “Project Overview – Woodrow Wilson Project.” VDOT web site. Kozel, Scott. “Springfield Interchange Improvement Project – Final Phase to Begin.” Online posting, misc.transport.road, September 23, 2003. “LEAD to receive update on I-95 extension.” Bangor Daily News (ME), September 16, 2003. “Despite wear, state says I-95 toll not in works.” The Herald, South Carolina October 26, 2003. “Higher tolls get initial OK.” The Baltimore Sun (MD), September 30, 2003. “HOT plans for 95” The Free Lance-Star (Fredericksburg, VA) October 11, 2003. “Support for I-95 tolls in N.C. should increase.” Raleigh News & Observer (NC),November 6, 2003. “Easley, Tippett: Agree To Disagree?” WRAL-TV Raleigh (NC), November 18, 2003. Jason (gps_man2003). “Re: I-95 section from Ft Pierce to PGA BLVD,” Online posting, Yahoo! Groups FL Roads, November 13, 2003. Kozel, Scott. “Re: [seroads] VDOT criticizes I81 plans.” Online posting, Yahoo! Groups Southeast Roads and Transport , November 18, 2003. “Interstate I-95 Redesignation & Re-numbering Information,” http://www.state.me.us/mdot/maines-transportation-systems/I-95-redesignation.php Maine Department of Transportation. Divided Highways: Building the Interstate Highways, Transforming American Life in 1997 by Tom Lewis, Viking Penguin/Penguin Books, page 197. John F. Kennedy Memorial Highway fact sheet. http://www.mdta.state.md.us/mdta/Documents/jfk.pdf#search=’john%20f%20kennedy%20highway MDTA web site. New Jersey Turnpike Fact Book. http://www.state.nj.us/turnpike/tpbook.pdf New Jersey Turnpike web site. About the Maine Turnpike. official site. Maine’s Interstate System: An Investment in Safety, Mobility, and Prosperity<. http://www.state.me.us/mdot/interstate/index.php Maine Department of Transportation. 95 Express Managed Toll Lanes in Miami Dade & Broward Counties (web site). “I-95 Express Lanes construction begins this week.” The Washington Post (DC), August 8, 2012. PA Turnpike / I-95 Interchange Project- Background. “Blacktop And Greenbacks: I-95 Turns 25,” State, The (Columbia, SC), February 18, 2001. “New Haven Interstate 95-91 interchange to head in new direction for first time in 60 years.” New Haven Register (CT), July 10, 2016. Whittier Bridge/I-95 Improvement Project fact sheet. http://www.massdot.state.ma.us/Portals/45/Docs/factSheet_Fall2013.pdf massDOT, Fall 2013. “I-95 in Mercer County to be renamed I-295 in early 2018, several exit numbers to change.” PlanetPrinceton, December 21, 2017.